A perfectly fall soup. 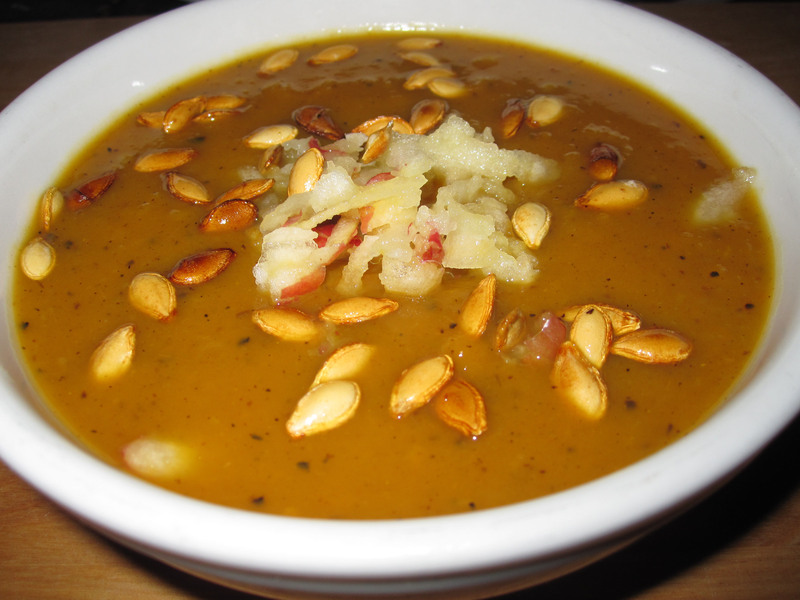 For those of you with abundant CSA shares, this is a great way to use your squash and apples. The apples make it a little sweet and the curry a little spicy. I topped mine w. some grated apple and toasted butternut squash seeds. You will need a food processor, a blender or a food mill. According to America’s Test Kitchen, a blender is the best way to go— but as I don’t have one, I used a food processor. Chop butternut squash, onions and apples in 1-inch chunks. Toss with olive oil, 1 teaspoon salt and 1/2 teaspoon pepper. Split among 2 baking sheets- spreading vegetables in a single layer. Bake for 35-45 minutes until vegetables are very tender. Meanwhile, heat stock to a simmer. When vegetables are done, put them in food processor/blender/mill and add a couple ladles of stock. Process in batches. Add soup back into a pot. Stir in a couple ladles of stock. Let it absorb– and add some more– stopping when you have the consistency you want- should be a thick soup. Add curry powder, 1 teaspoon salt and 1/2 teaspoon pepper. Taste for seasonings, be sure there is enough salt to bring out curry flavor. Can top w. a couple grates of apple. To toast butternut squash seeds– place on baking sheet. Add some olive oil and sprinkle liberally w. salt. Toast for about 7 minutes. While these taste good on the soup, I like to just to snack on them. This looks delicious, and in no way did Tessa pay me to say that. For $5. Plus free banana bread.